I’ve just finished teaching my usual slot on the London permaculture course. 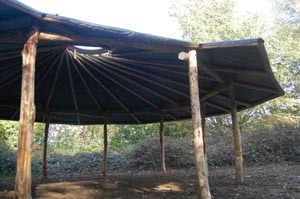 This course is mainly based Hawkwood run by Organiclea a community food growing coop. The 12 acre site is host to a bounty of amazing activities including this rather wonderful course. For the last two years the practical session of my green building slot on this course has been clay rendering of the strawbale classroom. We are using an experimental technique fixing split wood lathe to the stud frame and daubing this as if it were a wattle and daub wall. 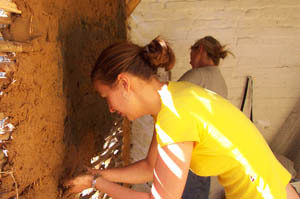 The daub is neat fresh dug clay mixed only with straw. This technique though not commonly used fitted the brief of entertaining 20 people for 1hr only on each annual course, allowing them to experience a ‘whole’ process of digging clay from the site and rendering the wall. So far the process seems to be working and this second year we returned to plug the gaps and apply a second layer. It remains to be seen whether plugging smaller and smaller gaps on successive visits finally results in a smooth finish, and if the final man/hrs spent is much different that if we have mixed all the clay with sand first. The cow byre needing a little love! 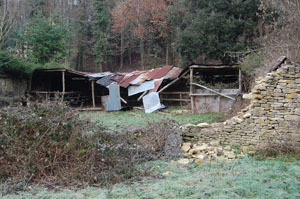 We are finally re-building the old 16th century cow byre at Hawkwood College Stroud. This project runs for Waldorf College as part of the ‘Bridging The Gap’ course, a BTEC in life skills. 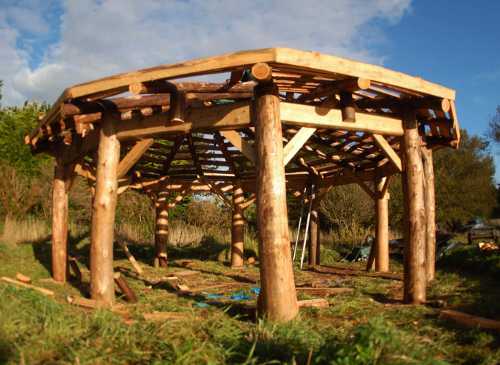 Our students will be involved in the process from start to finish, harvesting all the timber from the woodland and assembling the timber frame. The cow byre has been re-built several times over the years but has been short of love for a long time now. 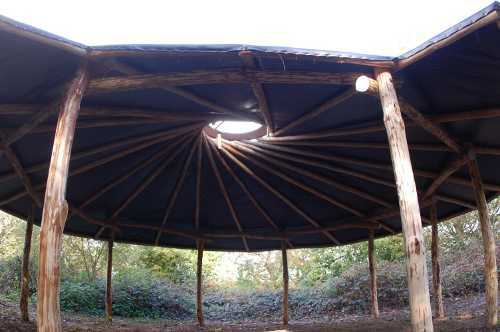 We are very excited to be breathing new life back into the structure which will now be used as an outdoor classroom.